Welcome to the Duncan Cowichan Chamber of Commerce website! The Duncan Cowichan Chamber of Commerce has been serving businesses in the Cowichan Valley since 1908. 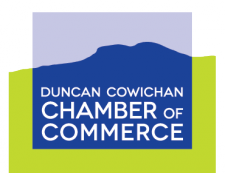 With over 550 members, the Duncan Cowichan Chamber of Commerce provides networking, promotional and professional development opportunities to businesses, individuals and organizations in Cowichan. The Duncan Cowichan Chamber also operates the Cowichan Regional Visitor Centre, which serves over 25,000 visitors annually.